With this project, I decided to work with photographs of my home and remove anything that had to do with my daughter, Chloé. I hand cut out things that were by her, of her, about her or because of her to visually depict the lack of her presence or the amount of my life that is taken up by her being in my life. 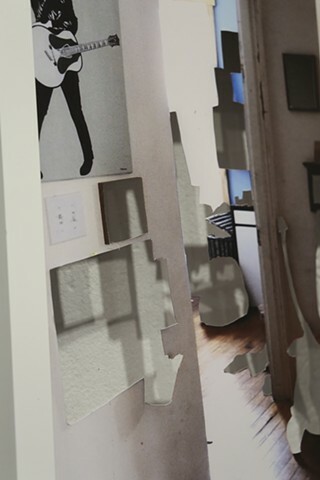 In the frames and mounted to the wall, each cut out creates a shadow on the wall in a constant play of presence and absences. Because of these subtle plays of light and shadow, they are extremely difficult to document. Each of these is printed at 24" x 18" in a 2" deep museum frame sandwiched between two pieces of plexi-glass. There are 6 hand cut prints in the series.